SÃO PAULO, BRAZIL – After eleven rounds of negotiations, bank employees from most institutions decided to suspend the 31-day-old strike on Thursday, October 6th, and go back to work already on Friday, October 7th. The only employees to continue the strike are some working for state-owned Caixa Economica Federal. 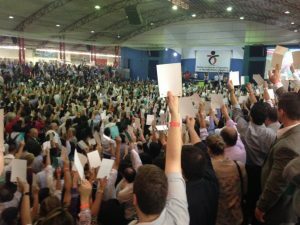 Bank employees vote to end strike during union assembly in São Paulo, photo courtesy of SPBancarios/Fotos Publicas. “We obtained important victories. The longest strike in history. The significant number of bank employees [on strike] showed the strength of our segment and national mobilization,” said Contraf-CUT (Confederation of Workers in the Financial Sector) President Roberto von der Osten Thursday night after the decision by employees to go back to work. FENABAN (National Federation of Banks) officials and employees agreed to a two-year deal which includes a wage increase of eight percent in 2016 plus a one-time bonus of R$3,500.00, in addition to increasing benefits such as food vouchers, nanny and meal tickets. For 2017, the Federation said it would increase wages by the 2016 inflation (measured by the INPC index) plus one percent. According to the (Contraf-CUT) during the 31-day-old strike over thirteen thousand branches in sixteen Brazilian states closed their doors. The number represented 55 percent of all bank agencies throughout Brazil. Originally the workers’ union demanded almost fifteen percent in wage increases (the inflation of the previous year plus a five percent wage hike), a one-time bonus of R$8,297, profit sharing results, increased values on meal and supermarket vouchers and increased daycare/nanny assistance while FENABAN offered a one-time bonus of R$3,000 plus the 6.5 percent wage increase. Employees of Caixa Economica Federal in seven states, including those in Rio de Janeiro and São Paulo, however, refused the offer and pledge to remain on strike.